Coconut is a tropical treat that we are seeing more and more on menus and in recipes, particularly due to the increased popularity of Asian and Indian cuisines. The coconut is a fruit, nut, and seed and is actually made up of three layers, providing coconut meat and liquid that are made into many different foods and beverage products, including coconut cream, coconut milk, and coconut water. With similar names, differentiating between them can be difficult. But once you know what they are exactly, how they are made, and their culinary uses, you will be able to choose the right coconut ingredient for your recipe. Coconut cream adds a nice thickness to a dish, without a lot of flavor or sweetness. It is made by simmering shredded coconut meat in water and then straining out the coconut solids. The resulting liquid is left to separate and the thick, semi-solid coconut cream is scraped off of the top. Coconut cream is unsweetened and is often used to thicken up a dish without adding dairy. Don't confuse coconut cream with cream of coconut, which is sweetened and used in desserts and beverages, such as a pina colada. Coconut cream has a high-fat content, most of which is saturated, and is essentially the same as coconut milk, but with a lower water content. Coconut milk is made using the same method as coconut cream. Shredded coconut is simmered with water and then the solid portions are strained out, usually with cheesecloth. Coconut milk comes in two varieties, thick and thin (although you may not find this distinction in the States). As the simmered liquid sits, the thick coconut milk will rise to the top and the thin coconut milk, which has a more translucent appearance, remains at the bottom. Most coconut milk sold commercially in cans will naturally separate in this manner during storage and transportation; the two phases can easily be mixed back together by stirring or shaking the can. Coconut milk has an average fat content of 17% but will vary from brand to brand. It is a common ingredient in Asian and Indian cuisine and can be used to make soups, sauces, curries, and beverages. It is often paired with spicy ingredients because the high fat, creamy texture has a cooling effect on the palate. A second type of coconut milk has emerged on the market as consumers are increasingly looking for dairy alternatives. This type of coconut milk has a much lower fat content than traditional canned coconut milk and is often sold in large cartons. It is used like dairy milk and poured over cereal, into coffee, or drunk straight as a beverage. Most recipes calling for "coconut milk" refer to the canned variety and not the dairy milk alternative. Coconut water is quite different from coconut milk and coconut cream. 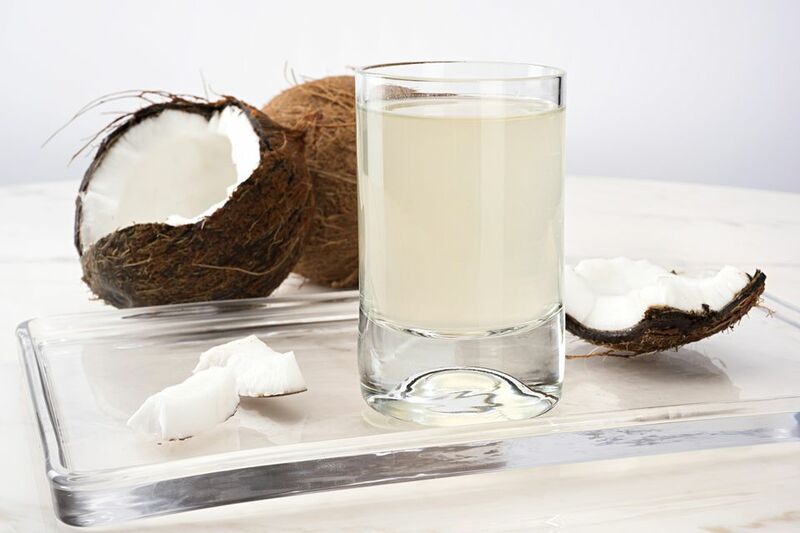 This clear fluid can be found in the center of young coconuts and does not contain any of the fat derived from the coconut flesh. Coconut water is high in potassium and other nutrients and is often consumed for its extremely hydrating qualities. In tropical regions, coconut water is often sold in the street, straight from the coconut itself. In recent years, commercial bottling and sale of coconut water have exploded. Although specific health claims have yet to be proven, consumers enjoy coconut water for its light flavor, low-calorie content, and natural nutrients.